Announced earlier in the year (June 2012), the recently updated Sigma 18-250mm f/3.5-6.3 DC Macro OS HSM for Nikon and Canon APS-C format DSLRs (for the purposes of this review but also Sigma, Pentax and Sony cameras) is a compact and lightweight “walkabout” zoom designed to replace several fixed focal lengths in one convenient lens. Because of the slight difference in sensor size between Nikon and Canon bodies the lens behaves slightly differently in performance terms and also with regard to the equivalent focal length when comparing it a full frame 35mm (24x36mm) sensor. On a Nikon body, such as the D7000, the lens has a similar angle of view to that of a 27mm-to-375mm, while on the marginally smaller Canon sensor it can be compared with or to a 28.8mm-to-400mm lens. With overall DxOMark scores of 10 for Canon mount and 12 for Nikon mount, variants are very close. What we’re used to seeing with this type of lens is that the optical performance is usually better at the wider end of the zoom range rather than at longer focal lengths and that’s true of this lens. While the results are on the low side, they are good for this category. You can’t expect a zoom with an incredible 13x zoom range to match zooms with more modest ranges, such as kit lenses, let alone compete with high-end zooms or primes (i.e., fixed focal length lenses). The Sigma performs best at the wider end particularly at 18mm from f/3.5 to f5.6, which is good news for those looking to use the lens for handheld interiors and landscapes. However, while the Sigma’s resolving power at 18mm is highest at wider apertures, sharpness is not uniform over the field. And the latter is also true of longer focal lengths. Sharpness is highest between f5.6 and f8 over the zoom range as a whole, but from our tests the measured acutance of < 50% at the corners of the frame over the 28mm to 250mm range is slightly disappointing. This accounts for the low-ish 6P-Mpix score, but is in fact a pretty decent score for a super-zoom. That said scoring 6P-Mpix, it is bettered by the rival Nikon AF-S DX NIKKOR 18-300mm f/3.5-5.6G ED VR. Distortion is another concern, and, at an average of 0.8% (pincushion), it’s quite noticeable. While we expect to see some barrel distortion at the wider end, which is within acceptable limits in this instance, pincushion is above average over the 28mm to 135mm range of focal lengths. This limits the appeal for taking pictures of buildings that have straight edges parallel to the borders of the frame, but it can be fixed or at least lessened in some software applications, such as DxO Optics Pro. Vignetting or lens shading can also be issue, although among lenses with relatively slow maximum apertures like this it’s often fairly mild. The Sigma is generally well-controlled with the exception of the 18mm f/3.5 and f/4 settings, and again at around 70-to-135mm over the maximum f/5 to f/5.6 apertures. Vignetting can be removed in-camera on some DSLR models, and it’s easily corrected in post-production software but it is still good see a maker reduce it as a part of the optical design. This lens uses a mix of low-dispersion (SLD) glass elements and aspherical lens elements to reduce chromatic aberrations but it appears Sigma reduced the number of SLD elements on price grounds (the new lens adopts a costly double-sided aspherical lens but is around 10-percent less at retail, depending on the country). Chromatic aberration isn’t particularly well-controlled at either extremes of the zoom range and at around 70-85mm and is noticeable on high-contrast edges, although to be fair it’s at acceptable levels. The original 2009 version was highly regarded generally, but it was not without some shortcomings. With a score of DxOMark 16 for the older, larger lens compared with a score of 18 for the 2012 version the difference is close and so the new model is considered to be only a minor update. There are however some slight improvements, which is good news given the reduction in size, weight and price. Scoring 6P-Mpix the resolution sharpness figures show a slight increase, meaning it’s slightly sharper where it needed to be. That’s to say, mainly in the 135mm to 250mm range, where longer focal lengths tend to fall off in definition. Reducing the size usually results in some penalties with regard to distortion and vignetting. Fortunately, the transmission rating remains the same and the only downside is a slight increase in lens shading (vignetting) at the maximum aperture. We would like to have seen a decrease in pincushion distortion but maybe we’ll see that next time around. As for sharpness-depriving chromatic aberration there’s actually a slight improvement, proving it was the right choice to replace the SLD glass in the rear groups with a double sided aspheric. When tested on the Canon EOS 7D (and other EOS models using the same size sensor) we can see how the lens performance favors the smaller chip. As a result the pincushion distortion is very slightly less as is the unsightly chromatic aberration. However, in fact, the lens is the same optically. Our only real gripe is the same regardless of mount and that’s the distracting pincushion distortion is higher than we would expect. When comparing the new Sigma with the best performing that we’ve tested, the Nikon AF-S DX NIKKOR 18-300mm f/3.5-5.6G ED VR, we can see that even a lens from such a highly regarded optical firm is not without some issues. The sharpness is quite good at 6P-MPix, vignetting is low and distortion, while high, is lower than the Sigma, and it’s 1/3rd of stop faster. But we can see it is somewhat troubled by high chromatic aberration, despite the inclusion of ED glass. Even without looking too hard the unsightly fringes are noticeable in the corners of the frame and are even worse at 50mm and 105mm settings. As for sharpness, prime lenses are likely to be much more capable of providing good results with today’s (and tomorrow’s) demanding sensors. The Sigma 105mm F2.8 EX DG Macro Nikon for instance can easily achieve a 50-percent improvement in resolving power with a score of 9 P-Mpix on the Nikon D7000. 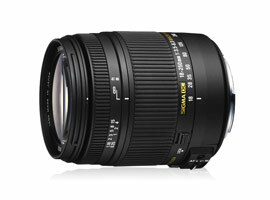 However, at around $1,000, the 2012 Nikkor lens is a pricey option. See to our own review: AF-S DX Nikkor 18-300mm f/3.5-5.6G ED VR Review. Canon users also have an excellent lens to choose from. While it’s a few years old now (announced in 2008, introduced early 2009) the Canon EF-S 18-200mm f/3.5-5.6 IS is a decent performer, as you might expect. With a 200mm maximum, this lens doesn’t have quite the same range of focal lengths but it has a four-stop image stabilizer unit and features Canon’s swift AF, focusing to just 0.45m. Two UD glass elements and multiple aspheric surfaces keep chromatic aberrations to tolerable levels, only being noticeable over the 50-to 200mm range. Moreover, sharpness is very close to the newer Sigma at 5P-MPix albeit with somewhat soft outer zones, however the lens exhibits a little more vignetting (at -1.6EV at 18mm f/3.5) and, of course, it has the usual barrel to strong pincushion distortion signature. It’s common for super-zooms to exhibit similar behavior with only average sharpness (particularly at the longer end of the range), strong distortion, vignetting and chromatic aberrations as well as other deficiencies. Such large zoom ranges stretch technology to their limits, and it’s this group that’s also one of the most price sensitive. Nevertheless, they are compelling for their flexibility and can’t be ignored. When viewed against rivals the Sigma performs very well indeed. For Canon users, it’s an excellent alternative to both the cheaper Tamron 18-270mm F/3.5-6.3 Di II VC PZD and the more costly Canon EF-S 18-200mm f/3.5-5.6 IS. The same can pretty much be said for Nikon users, though they have the advantage of a much newer Nikkor-branded optic. That has an extended range and slightly higher sharpness but its control of fringing is poor and at nearly double the price (in the USA at least) the Sigma is an attractive proposition and would make a solid choice.